A year ago in November, I was a day away from buying tickets with three friends to head down to New Zealand and climb Aoraki Mount Cook, but I snapped what was left of the scapholunate ligament in my right wrist and had reconstructive surgery that put me out of commission for months. Having recovered from that, Dale, Owen and I bought tickets to do the trip for real. Then, in October, I dislocated my knee in a freak sport climbing accident and tore my PCL and part of my medial meniscus. I thought the trip was toast. But I talked to the ortho doc and started doing PT like mad. 8 weeks later, we boarded a plane (a series of planes, really) for Christchurch. 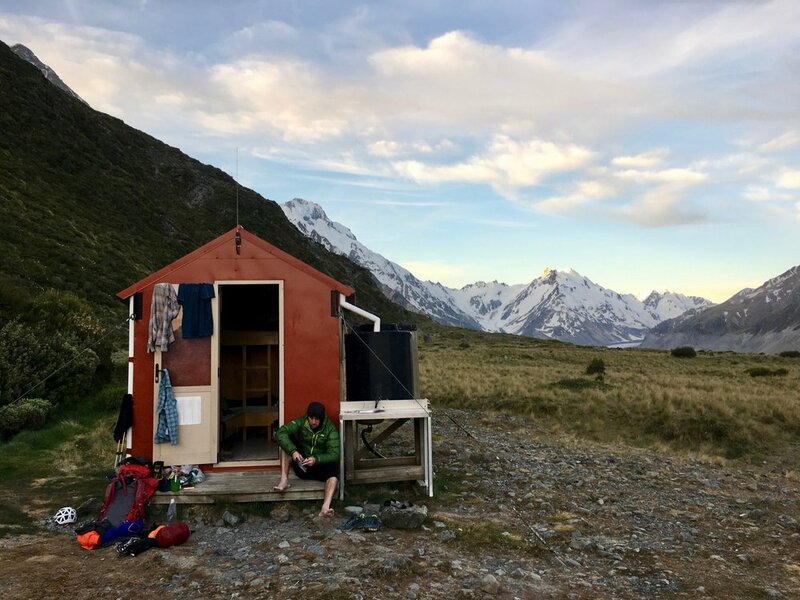 We provisioned up quickly in Christchurch on the day we arrived, crashed in an Airbnb, and then woke up early the next day to drive to Mount Cook and start the approach. 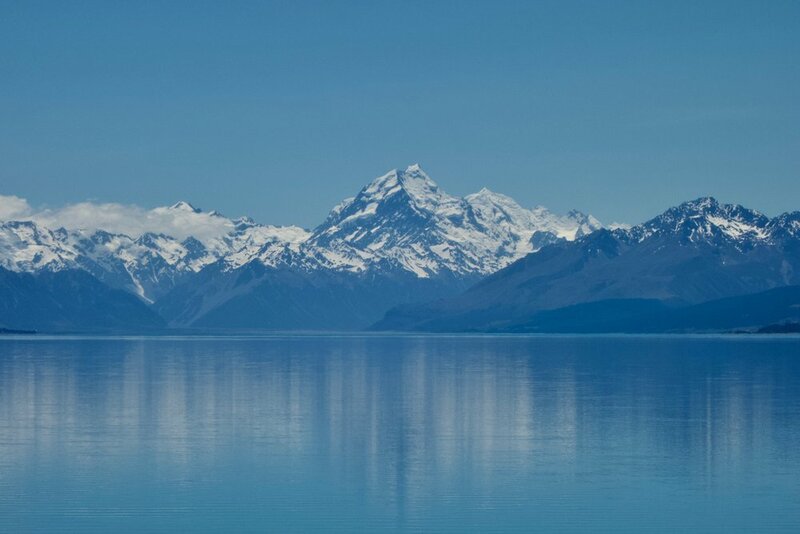 The drive was beautiful—past sheep pastures, alpine meadows, and the stunning Lake Pukaki. We checked in with the climbing ranger at the Department of Conservation who told us about the approach hike and route conditions. She was excited that we were planning to hike in as most folks fly in via helicopter these days to the Plateau Hut. She said if you can do the approach, you can climb the mountain. It sounded like there would be space for us in the hut, though it was going to be packed. We suited up in the early evening and left the Tasman Glacier car park, headed for the Ball Shelter about 5 miles in. The hike is mostly on an old road which eventually washes out and turns into a trail on and around the moraine. We got to the hut in about 2.5 hours and settled in for an early bedtime and early start the next day. We started a little after dawn the next day, searching around for a bit to find the best way down to the Tasman Glacier and eventually deciding that a shallow gully near the hut was best. We dropped about 500 vertical feet down to the glacier on scree—not so savory. Then we kept heading North on the glacier until the confluence of the Ball and Tasman Glaciers, where we had to navigate some undulating glacial ice covered in rock debris. It was at this point that we got our first view of the meat of the approach—about 3,000 feet of steep scree before snow on the Boys Glacier. We stood there for a bit. Nobody talked about bailing, but it was clear we were all thinking about it. The traverse of the Ball Glacier went fine and we used the last snow on the face to get as high as we could before stepping onto the downward escalator that we rode up the hill for the next few hours. It was bad, but not absolutely horrendous. We were very happy to reach the bench at about 5,250 feet and had lunch right at the edge of the snow. It seemed that the difficulties of the approach were over and that we just needed to slog up the Boys Glacier, over one col, down a bit, and then over Cinerama Col before descending and traversing the Grand Plateau. It turned out the technical crux of the day was still ahead of us—the bergschrund on the Caroline Glacier just below Cinerama Col was quite sunbaked and the snow bridge a party from earlier in the season had used no longer existed, so we had to get inventive. We found one spot where a few-foot thick piece of snow was still attached and stood on that, using a pole to create a channel in the snow through which we climbed up and to the other side. Dale got hero points for finding a way there. From the col, it was a solid hour and a half traversing the Grand Plateau in very slushy snow. I wasn't at all frustrated by the conditions though, since it was so beautiful up there, we could see the hut, and the ranger's quote hung with me: "if you can do the approach, you can climb the mountain." It was especially true for my knee, which had held up beautifully. We found the last 3 beds in the Plateau Hut, got some words of encouragement from guides and folks in the hut who hadn't seen many people hike in before, and crashed after agreeing that we needed more than 2 hours of rest before heading up the mountain, so our next day would be a full rest. We woke up late, ate all day, and enjoyed some down time in the gorgeous Plateau Hut. A number of parties had headed up that night and only a couple of them had made it to the summit—many parties turned around due to the state of the glacier and one party turned around at the summit rocks due to their timing in getting there. We awoke at midnight after a few hours of fitful sleep, had breakfast and geared up, then left the hut just after 1am. One other party, a guide and client, was also headed up that day. We were on a similar time table, which was good to be able to keep eyes on each other. In the darkness, but with a pretty full moon, we traversed the plateau and headed up the Linda Glacier on mostly frozen snow, finding many gaps to work around and jump over in the process. Three crossings in particular were more tenuous and, in the darkness, the crevasses seemed to go on forever below us. Thankfully, we made it through the maze with the help of the boot pack from the day before to guide us. We then turned left and headed up the upper Linda, underneath the huge ice fall and through a massive amount of debris, before making it to the hard left turn below the Gun Barrels. Dawn was just starting at this point and Mount Tasman lit up in beautiful hues of purple before getting bathed in golden sunshine as we continued up snow, across more crevasses, and to the saddle below the summit rocks on Zurbriggen Ridge. The access gully for the summit rocks was moderately steep ice and snice, which we simul-climbed. It produced heroic one-hit wonders. Dale let out some big whoops he was having so much fun. The summit rocks took a bit of time with about 6 30m 'pitches' or so. We simul-climbed some bits and pitched out others, given the amount of loose rock with little snow and ice to keep it together. At the top of the summit rocks, it was 9:45am. We were all nervous about the ice fall and snow bridges below us in the afternoon heat, so we stopped there and debated our options. We eventually settled on comfort in the fact that we could skirt the bottom edge of the debris and that the snow bridges still had some life in them, as well as the fact that the snow bridges were pretty far down the route and we could bivy there if absolutely necessary. So we pressed on, reaching the summit 45 minutes later after climbing pretty exposed, steep snow and running all the way around the bergschrund on the ice cap to the North Ridge before being able to gain the summit. We celebrated briefly before starting to head down. Everything went smoothly on the way down, including the raps down the loose summit rocks and one gap that we had to jump since the bridge had collapsed and the snow was too soft to simply step over. 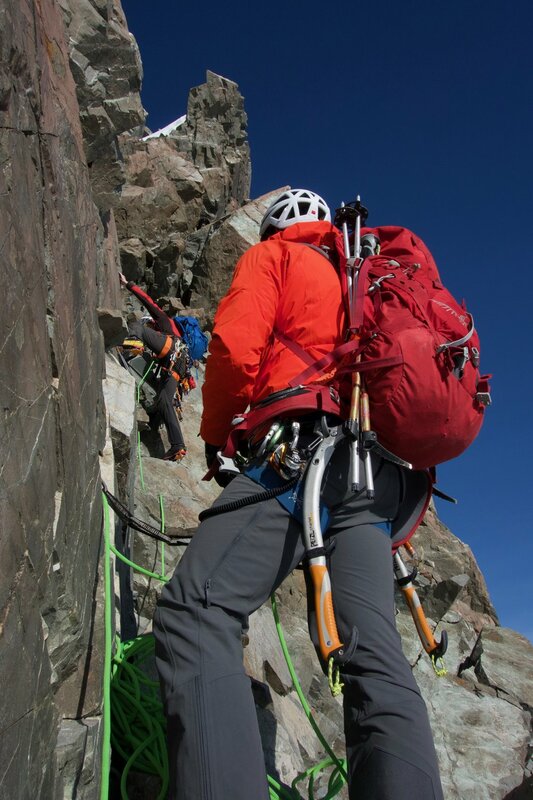 We took turns giving each other boot-axe belays and hucking ourselves across the thankfully down-hill gap. We made it back to Plateau hut a bit before 6pm with plenty of daylight to spare. We were elated and had a feast with all the food left by the parties flying out that evening. It turned out only our party of 3 and a party of 2 Japanese climbers were in the hut that night, so it was a stark contrast to our first night with 28 other folks in there. Everyone was leaving because the weather was closing in—strong winds were expected overnight, but it was supposed to be good enough in the morning to fly, so we arranged for a helicopter and flew out in a nice lull in the weather with our new Japanese friends. Having expected to spend more time up there to climb more peaks and/or wait for weather, we found ourselves with over a week to explore the southern island of New Zealand. Not bad at all! We lucked out in terms of weather and conditions. 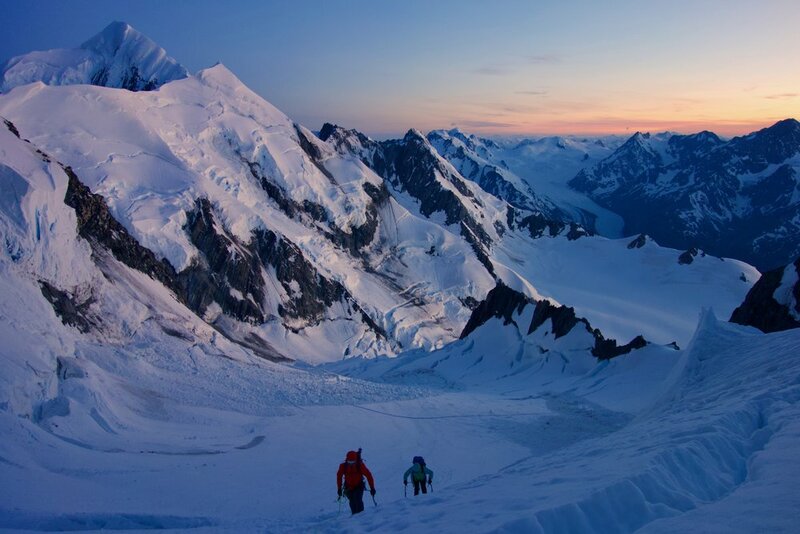 It was a great climb, with lots of different experience required to reach the top—endurance, glacier travel, steep snow and ice, as well as rock.